Pianist Aristo Sham has already dazzled audiences on five continents, in countries ranging from Singapore and Argentina, to Slovenia and Morocco, to China and Iceland. Mr. Sham’s upcoming appearances include the Rachmaninoff Concerto No. 3 with the London Symphony Orchestra conducted by Sir Simon Rattle in Hong Kong. He has performed as soloist with the Hong Kong Philharmonic Orchestra conducted by Edo de Waart, English Chamber Orchestra under Raymond Leppard, Orchestre de Chambre de Lausanne, and the Minnesota Orchestra. In addition, he has given recitals for the Dame Myra Hess Memorial Concerts in Chicago and the Salle Cortot in Paris, and performed for royalty and dignitaries such as Prince Charles, the Queen of Belgium, and ex-President Hu of China. 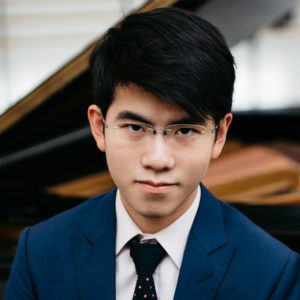 Mr. Sham won First Prize at the 2018 Young Concert Artists International Auditions at the age of twenty-two, and was also awarded special prizes: the Hayden’s Ferry Chamber Music Prize, Vancouver Recital Society Prize, John Browning Memorial Prize, Paul A. Fish Memorial Prize, Rhoda Walker Teagle New York Debut Prize, and Korean Concert Society Kennedy Center Debut Prize. He also won First Prize in the inaugural Charles Wadsworth International Piano Competition and the Silver Medal at the Gina Bachauer International Artists Piano Competition in 2018, First Prize and the Barenreiter Urtext Special Prize at Germany’s Ettlingen International Piano Competition, First Prize at the 2016 New York International Piano Competition, and top prizes at the Viseu (Portugal), Wideman, PianoArts, Clara Haskil, Saint-Priest and Viotti Piano Competitions as well as the Verbier Festival in Switzerland. A native of Hong Kong, Mr. Sham began playing the piano at three, and entered the Hong Kong Academy for Performing Arts at six. He attended the Harrow School in London, and at the age of twelve was featured in the documentary “The World’s Greatest Musical Prodigies,” broadcast by Channel 4 in the UK. Aristo Sham is currently in a joint program of Harvard University and the New England Conservatory, pursuing a BA in Economics and French and an MA in Piano Performance. He also travels to Sweden for studies at the Ingesund School of Music. In his free time, Mr. Sham enjoys travelling, languages, gastronomy and oenology.